Tyne Bank Brewery: Whitley Bay Rockcliff RFC Beer Festival. Whitley Bay Rockcliff RFC Beer Festival. This weekend, Rockcliff Rugby Club in Whitley Bay are hosting a beer festival, featuring around 60 different ales from across the country. 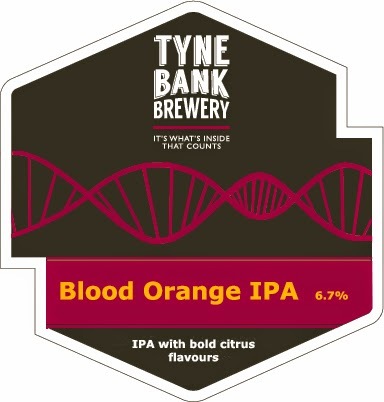 We have brewed a beer especially for the festival, taking inspiration from a beer which Northumbria University's Ale and Cider Society brewed with us recently, a blood orange IPA. This one off cask brewed on our test kit weighs in at a powerful 6.7%, and is brewed with a blend of US and New Zealand hops to compliment the bold citrus flavours of the blood oranges. It will only be available at the festival and when its gone, its gone. There will a great selection of Tyne Bank beers available, alongside beers we have supplied from our friends at Revolutions Brewing Co, Dark Star and Hand Drawn Monkey amongst many others from both local and national breweries. There is a VIP evening on the Thursday night, with the festival opening to the public at 4pm on Friday with live music, and from 12 on Saturday. All the details are in the poster above, make sure you head along and enjoy some great beer. Full beer list can be found here. We will also be providing the club with a house beer, so fans and players can now enjoy a tasty, locally brewed ale after the match.